Summer speaks to me of marinated fish – quick, easy and fresh for those sultry days and balmy evenings. 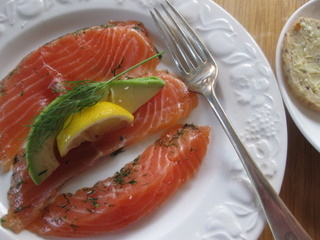 It’s always a close-run thing between ceviche and dilled salmon (aka gravad lax) – this week dilled salmon won out. The recipe comes from my brother Simon – he does it with reservoir-caught, pink-fleshed trout, of which he tends to catch a more than adequate sufficiency and can’t quite think what to do with them all. I use farmed salmon, either Scottish or Norwegian. Before you curl your lip in scorn at the very idea, remember that the very fact that farmed fish is fatter and flabbier than wild works in its favour for this particular kind of treatment: curing it with salt and sugar draws out loads of liquid, and in the process firms the fish up nicely. And of course the dill does the biz on the flavour front. It’s almost embarrassingly easy – the kind of recipe that looks like you spent hours slaving over it, while in fact the prep time is about 10 minutes and the rest of the time the fish is quietly slumbering away in the fridge, imbibing all that gorgeous herby, salty sweetness. And the result is soooooooooooo much more subtle and interesting than smoked salmon. What to drink with your dilled salmon? 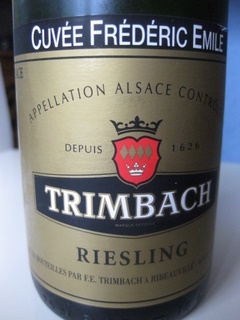 Friends (very good friends, indeed) arrived recently fresh from a tasting chez Trimbach in Ribeauvillé bearing a bottle of 2005 Riesling, Cuvée Frédéric Emile (thank you Anne!). It went into the fridge for a brief spell, then out came the cork and we poured the golden nectar, bent low over our glasses and inhaled the wondrous scent of grown-up Alsace Riesling: petrolly hints, loads of citrus fruits and minerality and – in the unmistakeably elegant Trimbach style – perfectly dry. Not sure what they’d think of this particular match up there in Scandi-land (though the Nordic countries are among Maison T’s most faithful markets) but we went into a bit of a rave about how perfectly it worked with (and at the same time cut across) the rich, oily, herby fish. Final footnote: I have to admit that I really, really don’t care for the classic sweet, mustardy dressing that’s normally served with gravad lax. It risks sending both me and Frédéric Emile sharply into reverse, so I give it a miss, preferring to serve the salmon simply with buttered brown bread (home-made by Marc and me) or with pumpernickel. Or even, in a pinch, with some slivers of avocado and a squeeze of lime. 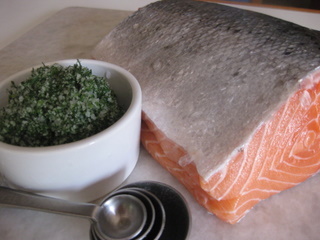 Two fillets (‘sides’) of salmon or sea trout are marinated in salt, pepper, sugar and plenty of dill. 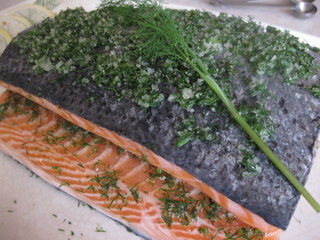 If you have only 1 fillet, either cut in half and sandwich the two halves together, or leave it whole, divide the salt/pepper/sugar/dill mixture in two parts and put half underneath the fish and half on top. Give yourself plenty of time – the fish should marinate at least 12 hours and can go for up to 5 days. love to think of you enjoying the posts from the DF/NO – let me know how the Med ideas work out! And delighted to think of Brinley enjoying them too – is she still in London? I’ll mail you, time for a ‘proper’ cyber-chin-wag!